Springtime generally offers a more predictable snowpack in the mountains, but avalanche activity continues into summer in Northwest Montana. Avalanche conditions are dynamic - snow stability deteriorates quickly with subtle changes in snow, rain, wind, sun, and temperatures. Continue to assess the weather, snowpack, and terrain, and practice safe travel techniques until the snow melts. 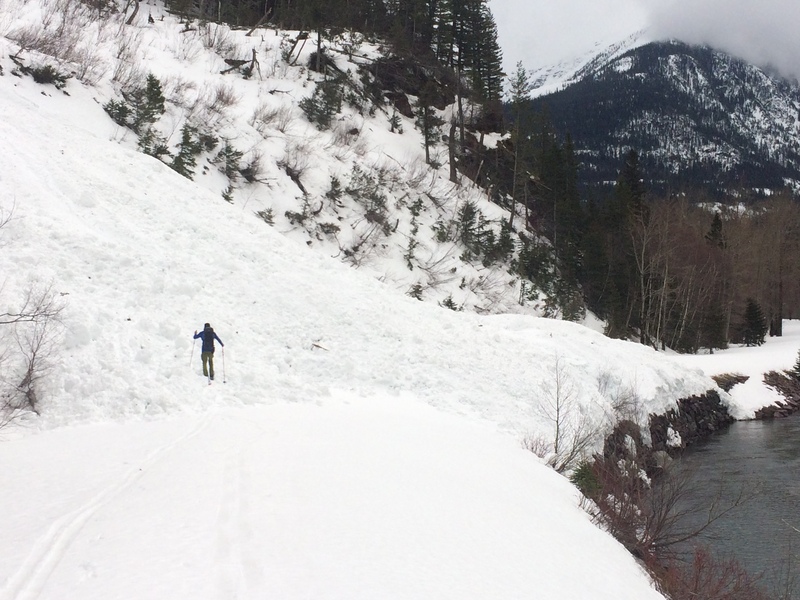 Loose wet avalanches are the most frequent avalanche problem in the spring. Unconsolidated new snow or saturated wet snow sheds off steep terrain with rising temperatures, sun, or rain. These slides release from a single point but produce a surprisingly powerful amount of debris if they run long distances or entrain a lot of snow. Rollerballs, pinwheels, or natural sluffs warn of decreasing stability. Move to colder snow or lower angled terrain when the snow becomes slushy or gloppy, and use extra caution below long-running gullies. There are several dormant crusts and old weak layers buried in the middle and bottom of the snowpack. As meltwater pools and compromises the strength of buried layers, destructive wet slabs can release. Wet slab avalanches usually fail during prolonged or intense warmups, but are challenging to assess and predict. Travel early while the snowpack is frozen. If the snowpack doesn’t refreeze overnight, avoid steep terrain. Post-holing in wet snow is a sign you’re not welcome in avalanche terrain. Meltwater in the snowpack can also lubricate the ground, resulting in unpredictable catastrophic glide avalanches. Avoid traveling below slopes with glide cracks or large, overhanging cornices, especially during or shortly after warmups. These conditions can result in very destructive debris that runs across all elevation bands onto bare ground. Spring snowstorms often produce sensitive, short-lived instabilities including wind slabs, storm slabs, and loose dry avalanches. New snow commonly accumulates on crusts and needs several days to bond. During active weather, monitor storm totals, wind loading patterns, and bonding of the new snow. Shooting cracks, more than a foot of new snow, or blowing snow are signs to stay off terrain steeper than 35 degrees. The FAC is closing its doors for the season, but an above average snowpack and a wet outlook for this spring mean that avalanche concerns aren’t going away anytime soon. As of April 15, the snowpack remains largely dry and winter-like above 5500’, and we will be dealing with a mix of winter and spring avalanche concerns in the near future. 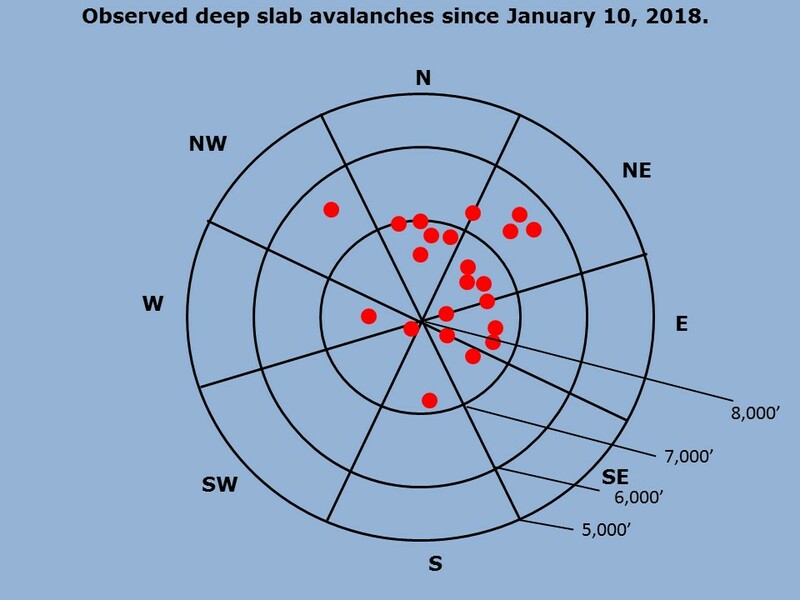 The most common avalanches this spring will be loose wet or storm instabilities near the surface, but don’t forget the poor basal structure that produced numerous deep slab avalanches this winter. Only time will tell if the Thanksgiving crust, or other mid-winter crusts, will produce destructive wet slab avalanches once the alpine snowpack goes through a major thaw. The intensity of our impending alpine thaw will likely dictate the outcome. Consecutive nights without a refreeze at higher elevations or recent wet slab activity mean it is time to take up a summer hobby until the snowpack refreezes again or transitions to a mature state. We encourage you to continue to share and check observations, and use our weather stations map to follow conditions. We will continue to update our social media with critical observations. Thanks for a great winter and have a safe spring! -Zach, Mark, and Chris.